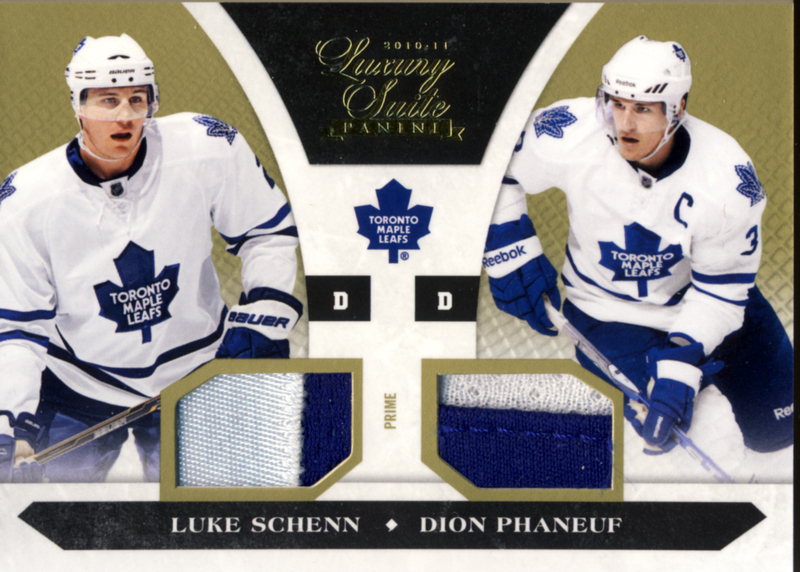 From reading our blog you know that Panini is coming on strong with three highly anticipated releases of hockey cards, Luxury Suite, Zenith and Dominion. We’ve referred to these releases as their potential Hat Trick. Luxury Suite is now available and with this first set, Panini shoots and scores. Luxury Suite fits into our premium cards category. Each hobby box contains 4 packs with 3 cards per pack. Each box contains 8 autograph or memorabilia cards. 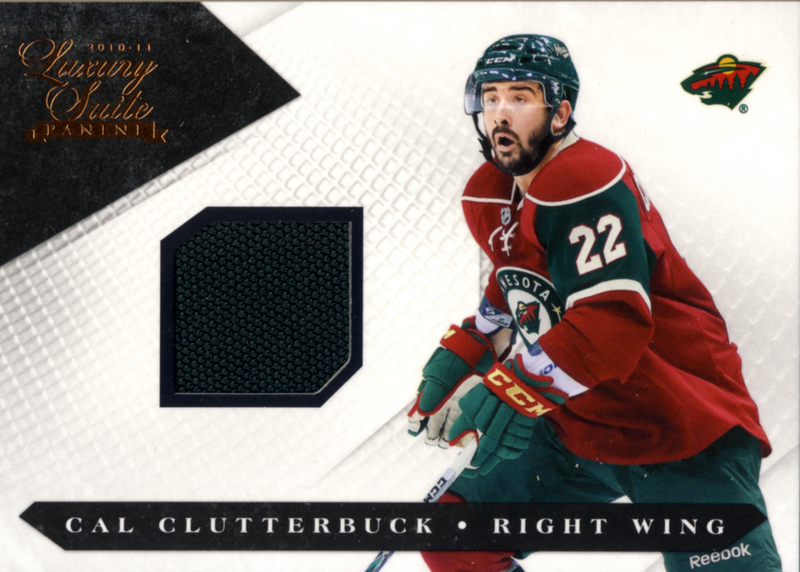 From opening the packs it is clear to see for the most part the packs consist of a Group 4 Rookie card on top, followed by a single game used sweater card with the last card being the big hit of the pack with a dual sweater, stick and sweater combo or a variety of autograph cards. 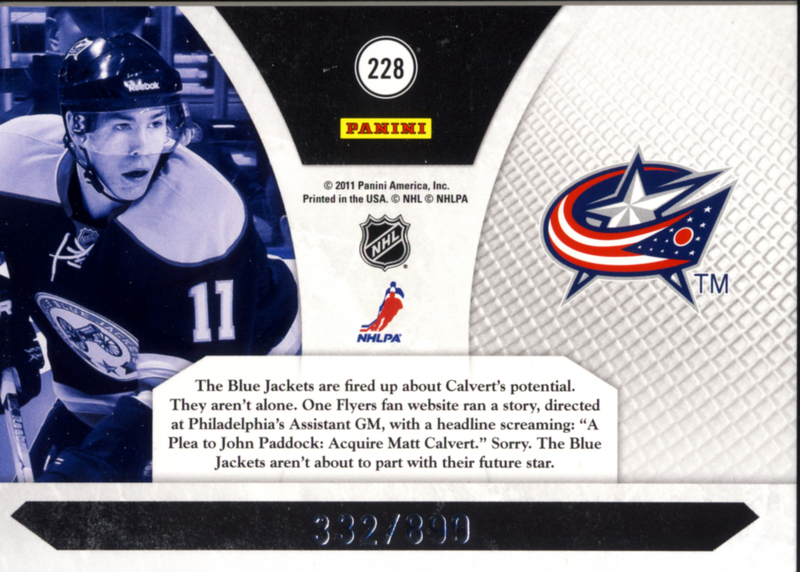 Our box came with an extra Group 4 rookie card for a box total of 13 cards. Here are the cards we pulled from the box. 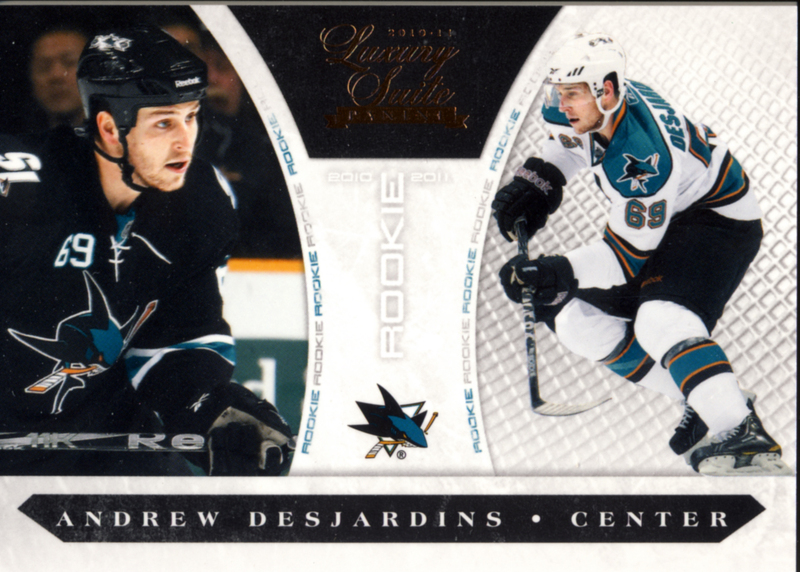 Here are the other Group 4 Rookies, all #/899. 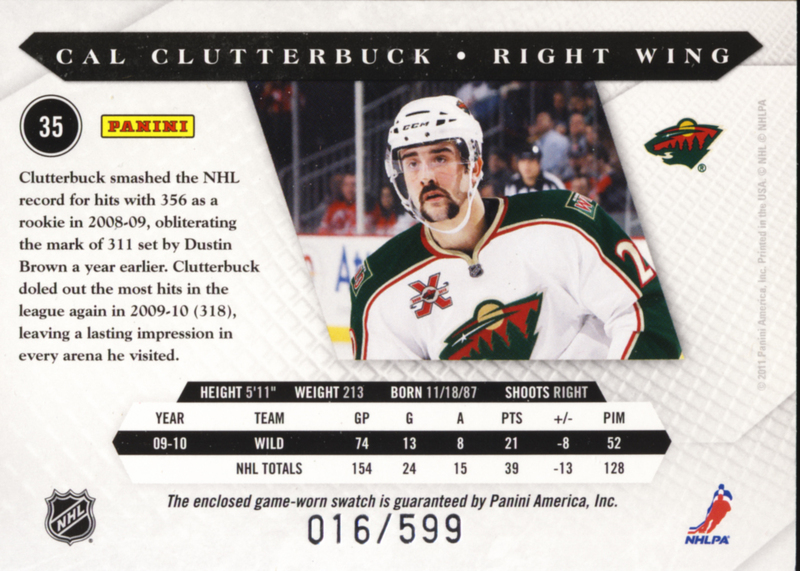 Cal Clutterbuck #/599 front and back. 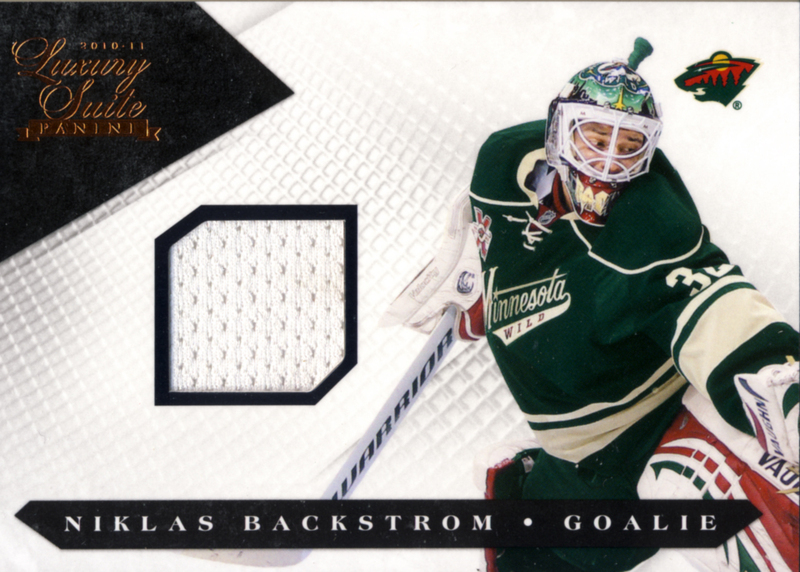 Here are the other Single Swatch Cards, all #/599. 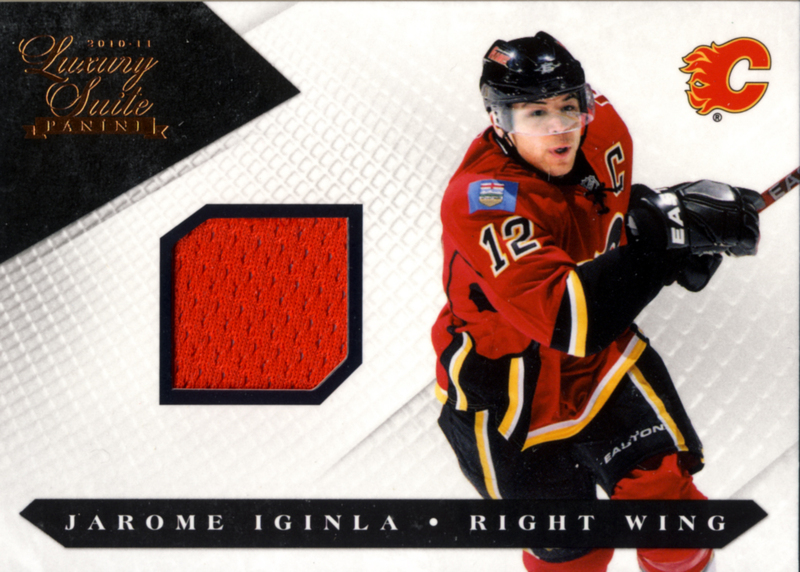 Niklas Backstrom, Jarome Iginla and Drew Doughty. 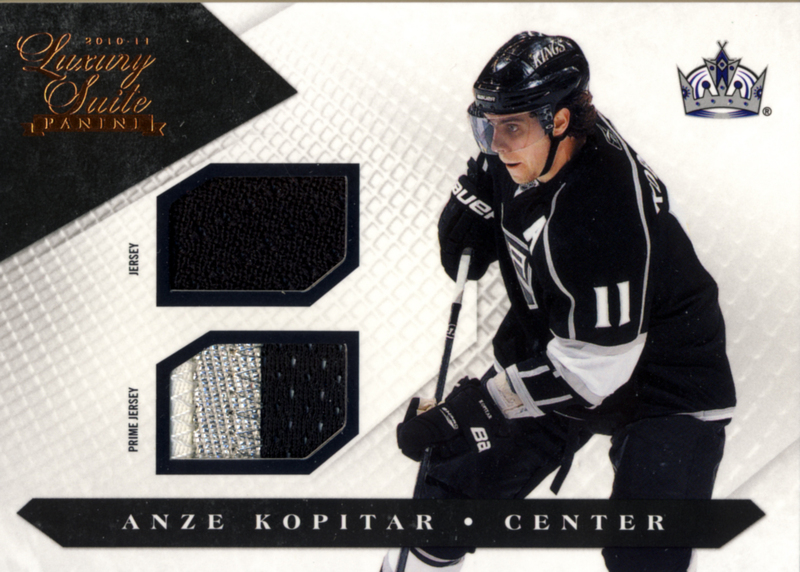 Anze Kopitar and Claude Giroux, both #/150. 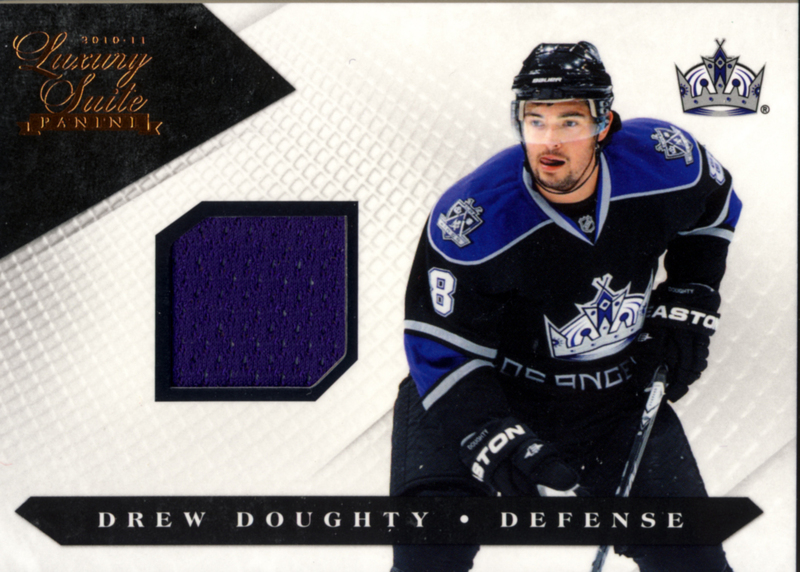 The backs have the same design as the Single Swatch Cards. 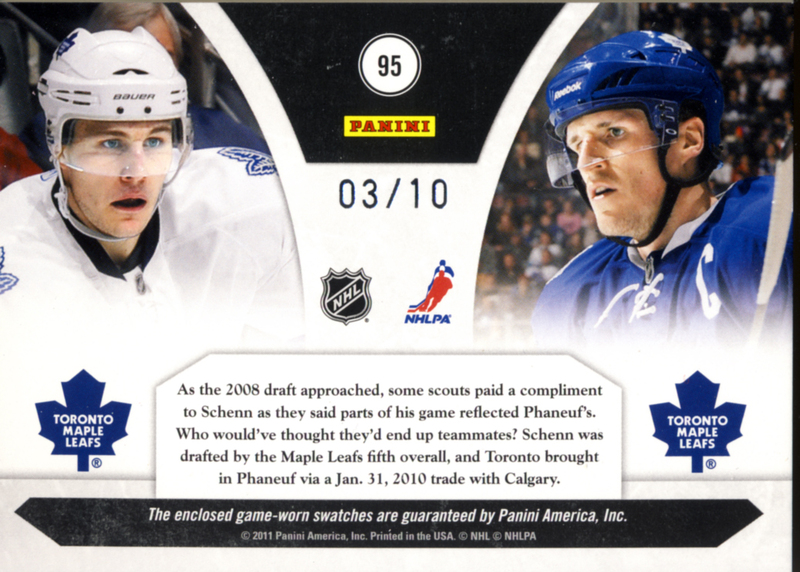 Here are the two biggest hits of the box. The first thing you notice is the thickness of these cards. They have to be super thick to contain the amount of swatch material they hold. 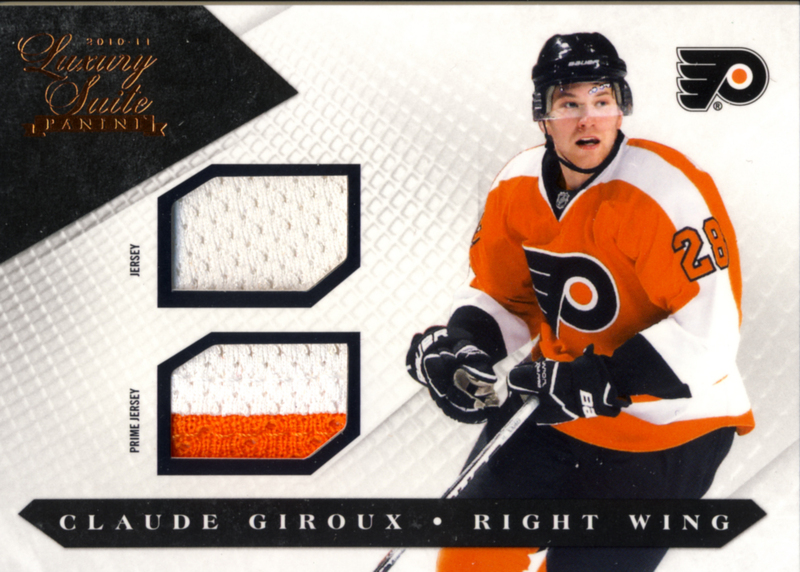 Some of the prime patches are so thick, especially the triple color ones with stitching, they expand beyond the cards’ swatch openings. You can see there was a lot of care taken with the cutting of the cards, corners are sharp and lines are straight. The design is really nice and thought was taken to prevent over powering the display of the materials. 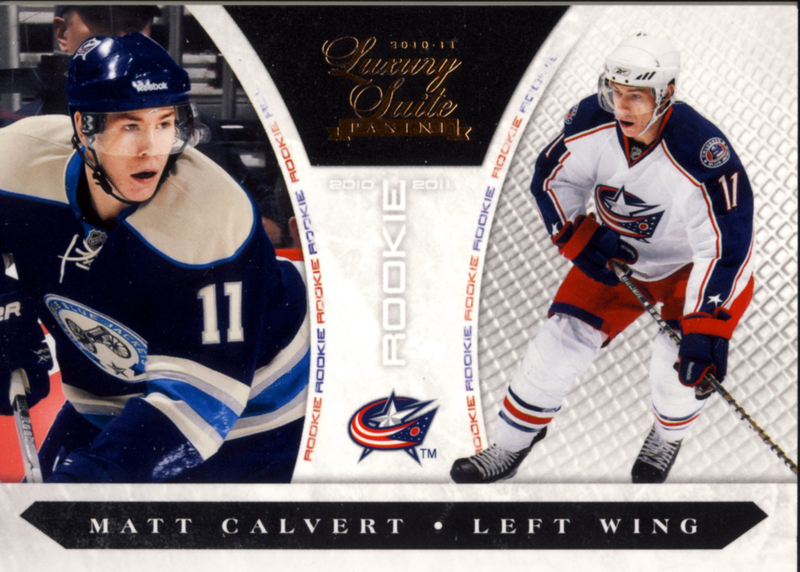 There is a nice gloss finish to these cards, but it is not your standard shiny. It’s more like a freshly waxed sports car. Bronze foil accents for the logo are just enough. The checklist is really tight for star players. There are 125 Rookies divided into 4 groups. 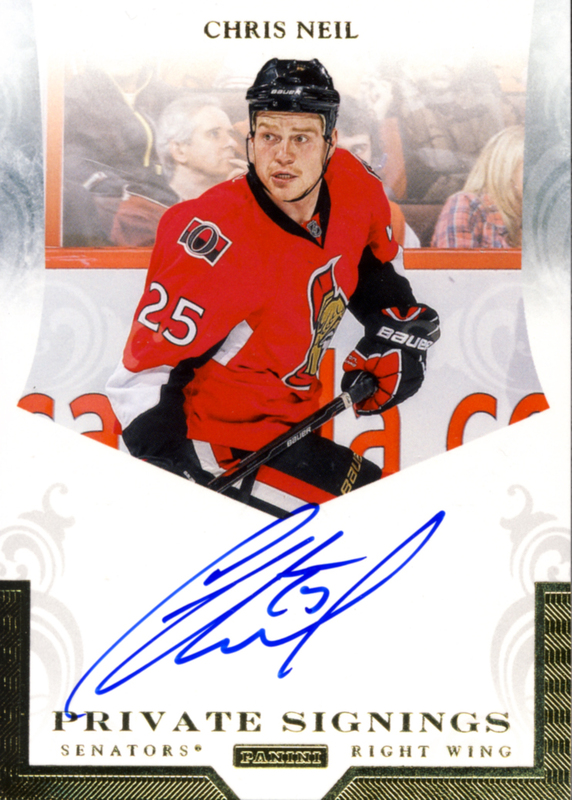 Group 1 Rookies (10 cards) are the break out rookies like Tyler Seguin, Cam Fowler, Taylor Hall and Rookie of the Year Jeff Skinner and these cards are Prime Swatch Autos #/199. Group 2 Rookies (10 cards) are Swatch Autos #/299. Group 3 Rookies (30 cards) are Autographs #/499. 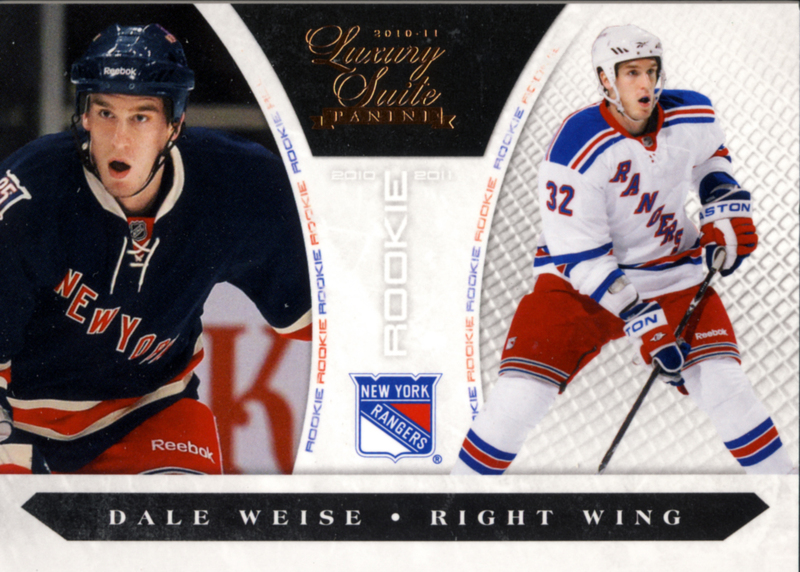 Group 4 Rookies (75 cards) are base cards. 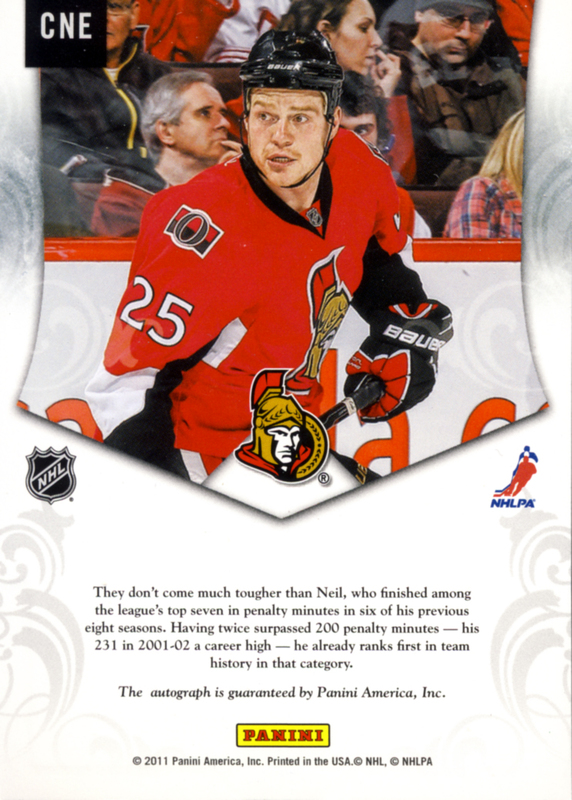 Base cards are hits in this product so no problem there. Some of the prime swatches and pieces of stick are very cool. 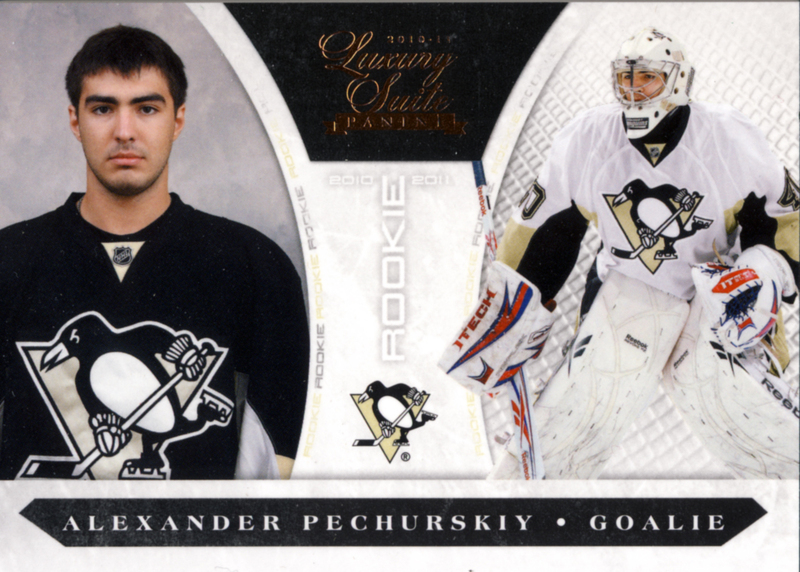 As usual, Panini does really well on the Hockey Autos. This could become an addictive product for swatch chasers and those willing to put together a master set of this release. 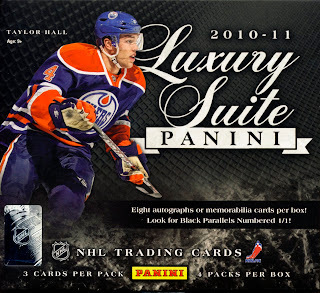 2010 - 11 Panini Luxury Suite an enticing product for the “lottery box” minded collector.